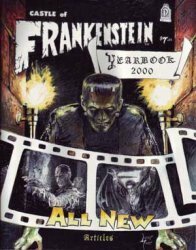 Castle of Frankenstein 2000 Yearbook Annual #2 is one of the revival issues after the initial run from 1962-1975. 68 pages. Color cover and B&W pulp pages inside. Printed in Summer 2000. Collectors Note: Brand-new and uncirculated. Picked directly from the printer's cartons.